As a Respiratory Therapy student, you are required to know and understand several different classes of medications. Cough and Could Agents are just another important set to add to the list. 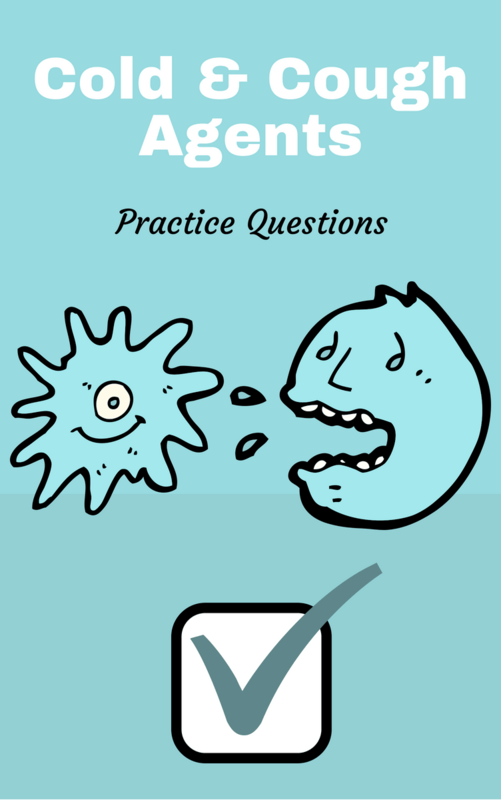 In this study guide, as you will see below, we have compiled several helpful practice questions that can help you learn everything you need to know about all the different Cough and Cold Agents. Let’s dive in! 1. What is the common cold? It is a viral (non-bacterial) upper respiratory infection and lasts 7-10 days. Non-bacterial upper respiratory tract infection with symptoms of general malaise, runny and stuffy nose, sneezing, cough, possible sore throat, and some chest discomfort. 2. What is the flu? Influenza, caused by a viral infection, rapid onset, and top 10 killers in the U.S. along with its complications. 3. What is the treatment for the flu? Antivirals and the flu vaccine. 4. What are sympathomimetics used to treat? 5. What are antihistamines used to treat? They suppress the cough reflex. 7. What are sympathomimetics mechanisms of action? 8. What are intranasal corticosteroids? Nasal sprays, anti-inflammatory, and inhibit cytokine release from nasal epithelial cells. 9. What are the effects of antihistamines? Cause drowsiness, Benadryl, H-1 and H-2 receptors are blocked. 10. What is the description of the production of histamine? Non-specific stimuli to tissue, chemicals, injury/trauma, allergens, drugs, dust, and cigs. 11. Where is histamine stored? Stored in tissue mast cells located below the respiratory tract mucosa and connective tissue. 12. Where is histamine released? The autonomic nervous system via receptor sites on mast cells. 13. What is airway obstruction? Mucosal edema, inflammatory cell infiltration with eosinophils, and influence release of local mediators. 14. What are the effects of histamine? Increase airway resistance, decrease max expiration flow, decrease diffusion capacity, increase total lung capacity, increase mucous production, vasodilation, increase vascular permeability, and stimulates adenyl cyclase in mast cells. 15. What is the antihistamine mechanism of action? Block action of H-1 receptors and prevent or inhibit mediator release from storage sites. Expectorants are agents that facilitate removal of mucus from lower respiratory tract. They are drugs that increase stimulation of mucus. Best is water and avoid caffeinated or alcoholic beverages. 17. What are mucolytic expectorants? Facilitate removal via lysing action. Agent that facilitates mucus removal by lysing or mucolytic action. 18. What are stimulant expectorants? They are agents that increase the production and clearance of mucus secretions in the respiratory tract. 19. What is the anatomy of mucus? It covers surface airways and 5-10 microns thick. 20. What is the composition of mucus? 95% water with 5% protein and lipid molecules. 21. What is the function of mucus? Shields epithelia from direct contact with toxic materials, prevents infection, and lubricates airway. 22. What is caused by dehydration? Increased respiratory rate, increase the depth of breathing, fluid loss, and infections. 23. What disease caused increased mucus? Bronchitis, asthma, cystic fibrosis, and pneumonia. 25. What can enhance diuresis? Caffeine, tea, cola, beer, and alcohol. 26. What is the expectorants mechanism of action? Increase vagal gastric reflex stimulation, absorption into respiratory glans, and topical stimulation. 27. What is the best expectorant? 28. What is a cough? Stimulation of the vagal sensory endings. 29. What is the antitussive mechanism of action? Depress cough center in the medulla. 30. What patients should not be given cough depressants? Patients with thick retained secretions. Adrenergic acts to vasoconstriction blood vessels and reduce inflammation of the nasal cavity and rebound congestion will occur with prolonged use. Drugs that reduce the effects mediated by histamine, reduces/dries secretions but cause drowsiness, and nocturnal use more indicated that around the clock use. Blocks increased capillary permeability and bronchial smooth muscle constriction. 33. What is the most common virus to cause a cold? 34. What is the main difference between flu and cold? 35. What virus causes flu? 36. How do adrenergic agents relieve nasal congestion? The strong alpha effect causes vasoconstriction. 37. What are the examples of adrenergic decongestants? Sudafed and Dimetapp (pseudoephedrine), Sudafed PE (phenylephrine), and Afrin (oxymetazoline). 38. What is the hazard of using topical adrenergic decongestants? Repeated use increases secretions and nasal edema as drug’s effect fade. Can become addicting. This is known as “rebound congestion” or “rhinitis medicamentosa“. 39. After how many days can rebound congestion become a problem? 40. What are the hazards of systemic adrenergic decongestants? Increase in sympathetic side effects: increased blood pressure, tachycardia, anxiety, sleeplessness, tremors and increased concentrations in the bloodstream. 41. What are the four classes of cough and cold drugs? Adrenergic, antihistamines, expectorants, and antitussives. 42. What are the side effects of adrenergic decongestants? Tremors, tachycardia, hypertension, and rebound effect. 43. What are the side effects of antihistamines? Drowsiness, impaired responses, and mucosal drying. 44. What is an undesirable effect of expectorants? 45. What are the undesirable effects of antitussives? Not recommended for productive coughs and the logic of combination expectorant-antitussives is questionable. 46. Should medication be used to suppress a cough when the cough is productive? No, no it should not be used. 47. What should be noted when giving cold and cough medication? Productive cough, fever, any cardiac/pulmonary side effects, vital signs (BP) should be known, remember to only treat symptoms and should only be used short term. 48. What receptor does cold medicine have an antagonist for? 49. What does the H1 receptor control? 50. What happens when the H1 receptor is stimulated? Bronchoconstriction, mucus secretion, nasal congestion, wheal and flare reactions on skin. 51. What does the H2 receptor control? 52. What does the H3 receptor control? 53. What is the indication for antihistamines? Reduce/dry secretions in upper airway due to a common cold or allergic reaction. 54. What antihistamines are used as cold remedies (H1 antagonists)? Diphenhydramine (Benadryl), Loratadine (Claritin), and Fexofenadine (Allegra). 55. What antihistamines are used to treat ulcers (H2 antagonists)? 56. What are antihistamines considered due to their effects? 57. What is the effect of antihistaminic? Blocks histamine-induced vascular permeability, pruritus, and bronchial smooth muscle constriction. 58. What does the anticholinergic effect cause? Upper airway drying, cholinergic blockade, anxiety/nervousness, urinary retention, dilated pupils, and blurred vision. 59. What are the precautions for taking antihistamines? Drying effect causes impaction of secretions and possible sinus blockage and also drowsiness. 60. What are the examples of mucolytic expectorants? 61. What is an example of stimulant expectorants? 62. What is the MOA for stimulant expectorants? Vagal gastric reflex stimulation and production of mucus. 63. Why is water important with stimulant expectorants? It helps preserve normal mucus viscosity. 64. What are examples of expectorants? Guaifenesin/glycerol guaiacolate (Robitussin/Mucinex), iodinated glycerol (Iophen/Par Glycerol/R-Gen), and potassium iodide (SSKI, Pima). 65. What are the groups for antitussives? 66. What are the narcotic antitussives? 67. What are the non-narcotic antitussives? Dextromethorphan (DM/DXM), delsym, and benzonatate (Tessalon). 68. What is the indication for antitussives? A dry, irritating, and hacking cough. 69. What are sympathomimetics (adrenergic)? For decongestion and alpha stimulating property which leads to vasoconstriction. 72. What do antitussives do? 73. What are cold symptoms? Cough (hacking), mild fatigue, none to slight myalgia, nasal congestion, sneezing, and sore throat (common). 74. What are flu symptoms? High fever (typical), chills (typical), nonproductive cough, prominent headache, severe fatigue, myalgia usual, nasal congestion, sneezing, and sore throat (occasional). 75. What are topical sympathomimetic decongestants? Sprays or drops, faster results than oral applications but using theses a lot can cause a cycle of increased secretions, called rebound congestion, and addiction to use. 76. What happens in rebound congestion? The nasal mucosa swells (congested) and there’s no vasoconstriction. Causes local inflammatory response such as smooth muscle contraction, dilation, itching, pain and increased capillary permeability. Important mediator of local inflammatory response that causes smooth muscle to contract, increase capillary permeability and dilation, itching, and pain. 78. What are antihistamines effects? Sedatives (penetrate blood-brain barrier), anticholinergic (upper airway drying) and antihistaminic. 79. What are some brand name examples of antihistamine effects? Benadryl causes drowsiness; and Claritin and Zyrtec that prevents. 80. What is a smoker’s cough? Mucus is always irritating the throat because cilia are damaged. 81. What is a narcotic cough suppressant? Depress the cough center in the medulla and sedates. Examples are codeine and hydrocodone. 82. What is an example of a nonnarcotic cough suppressant? 83. What is the use of a cough suppressant? To suppress dry, hacking, and nonproductive cough. 84. What can be used for patients who are not responding to antihistamines? Ipratropium Bromide because it is an anticholinergic. 85. What is influenza (flu)? Non-bacterial infection with rapid onset of symptoms including fever, headache, and fatigue. 86. What is an adrenergic agent? An agent that vasoconstricts and relieves nasal congestion. 87. What are adrenergic decongestants? Useful for nasal clearing but rebound congestion can occur. 88. What does antihistamine agents do? Dry secretions through an anticholinergic effect and by blockade of H1 receptors. 89. What is a cough suppressant useful for? They are useful for the treatment of a nonproductive, irritating, dry, and hacking cough. 90. What is an indication for adrenergic agents? 91. What is rebound congestion? 92. What are the undesirable effects of adrenergics? 93. What are the two parts of the respiratory care assessment? Remember to only treat symptoms and that it should be short-term only. Do not suppress a productive cough. 94. What happens when injured tissue mast cells release histamine? Blood vessels dilate, fluid and cells leak from the bloodstream and migrate to the site of injury to fight infection and heal the injury, and smooth muscles constrict (lungs, uterus, and stomach). So there you have it! I hope this study guide can help you develop a good understanding of all the different Cough and Cold Agents that you must know as a Respiratory Therapist. Going through practice questions is an excellent strategy to learn and retain information, which is why we put this together for you. Thanks for reading and as always, breathe easy my friend.